Lark In the Park, a fun day for families in West Bridgford park with a pirate theme, took plac e on the warmest day of the year so far. The Fantastic Home exhibition was there with advice on everything from making the most of the current good weather with solar panels to insulating homes before autumn arrives. Advice was available to all – including those who came dressed as pirates! The exhibition was busy for most of the day, helped in part by being next to Jo’s Jingles. Rushcliffe Borough Council were taking pledes for a low carbon lifestyle in their willow pledge tunnel and an extended display of leaflets and information connected the Fantastic Home to the pledge area. There was significant interest in solar photovoltaic panels and we were able to give people outline outputs and expected income levels based as well as referring some people on who were very interested. There were also a lot of people who were surprised to find out that they had not enough insulation, these were directed to the new Warm Streets service. 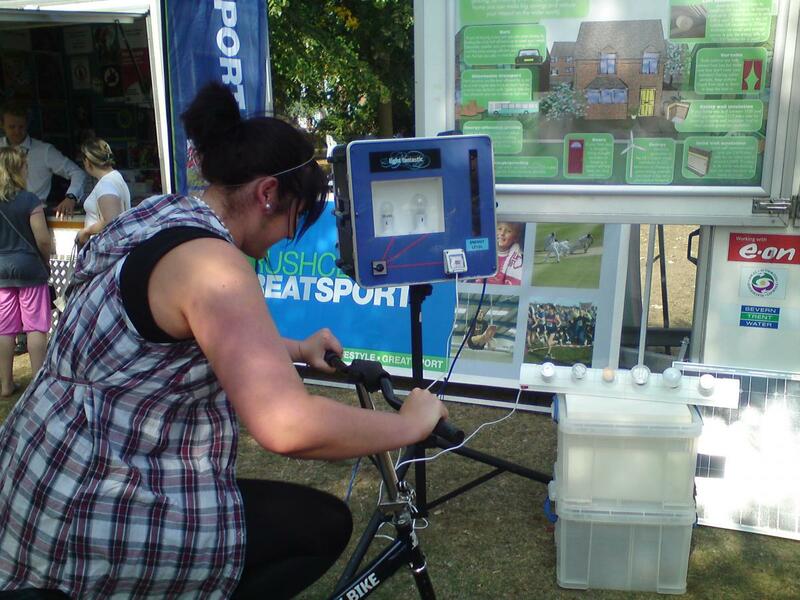 The bike was in constant use and the carbon snakes and ladders game was also very popular. We were able to help families out with tariff switching enquiries and also direct people to getting a water meter fitted where this would prove economically advantageous. A brief shower (as forecast) just before 4pm signalled the close of the day and was the first time there was not a large crowd around the exhibition for the entire day. The temperature isn’t the only thing that’s rising at the moment. Energy bills are also set to soar with three of the ‘big six’ utility companies recently announcing large price rises, and the other three expected to follow soon. So it’s a good thing that most borough, district and city councils in Nottinghamshire and Derbyshire offer great deals on insulation for all private householders. In many areas prices start from just £49 for loft insulation. If you are aged over 70 (or 65 in some areas) or in receipt of certain benefits you won’t have to pay anything for loft and cavity wall insulation. All private households – whether owned or rented – are eligible, although renters will need their landlord’s permission. Some schemes can also help with solid wall insulation, replacement heating systems, renewables, free items and other measures that will make your home easier and cheaper to heat. The need to be energy efficient is more pressing than ever. The subsidies currently provided by local authorities won’t be available after the end of 2012 and the government have yet to announce the details of the incentives that will replace them. Hard as it is to believe in the current heat wave, in just a few months we’ll all be turning on the heating as the temperature drops. Insulating your home now is a good way to make sure you’re ready for winter before it arriv es and some schemes even have special summer offers. To find details of the scheme for your area visit our Local Insulation Scheme section. To find out how insulation will benefit you visit the Insulation section. Broc the Badger Gets Some Energy Advice! 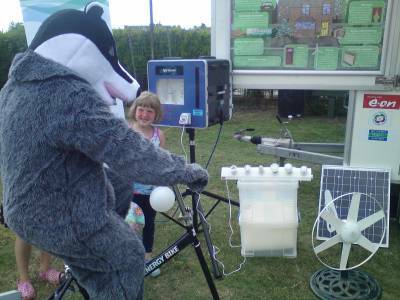 Broc the Badger visited the mobile exhibition Fantastic Home on 2nd July at Pary on the Rec, an event at Answorth Recreation Ground in Broxtowe. It was a busy event from the work go and we had a good position at the entrance. The stall was busy for most of the day, but as we had assistance from three representatives from Broxtowe Borough Council we were able to deal with more detailed enquiries from a number of visitors. There was great interest in solar of both types and the local plans for a large wind turbine stimulated some great debate. We were able to identify a number of families that were on the wrong tariff for their electricity and point others to offers for free energy monitors from their utility suppliers. The energy bike was in almost constant use all day and in particular from one boy who mastered powering 100W of lighting very quickly. He kept coming back wearing different clothes and with different face paint on so that he could have another go! Broc the Badger, Broxtowe Borough Council’s mascot, did a great job engaging people and driving them to the stall from elsewhere at the event and we got even busier then! Rushcliffe Country Park was the scenic setting for the Fantastic Home's visit to the annual Rush for Health event and the weather was on our side. There were some concerned expressions amongst the kite specialists attending the event in the morning but by the time the fun got started even the wind was on side. The day was marked by some in-depth conversations on energy efficiency, especially insulation and lifestyle changes and also renewable energy sources and the Feed In Tariffs and Renewable heat incentive. One gentleman even explained that using a solar photovoltaic system to generate his power he had managed to make his house completely carbon neutral and was now attempting to move into the negative by producing his own heat. Sheila Hood and Jenny from Rushcliffe Borough Council worked alongside new MEA volunteer Sophy Bellis and were all impressed at the general awareness of energy issues amongst the crowd. Many had already installed loft and cavity wall insulation. All in all a very productive and enjoyable day! Places are limited and pre-booking is essential by contacting: kirsty.mitchell@cse.org.uk. If you are interested in comunity-owned renewables then this event is for you! This free one-day workshop is for community group members, individuals, councillors who are portfollio holders for planning and/or environment and local authority planners. It will help you to engage with local planning and low-carbon development – and to understand how you can generate local energy. The events will feature the PlanLoCaL model, a large-scale model of a town demonstrating how renewable energy technologies work, and the PlanLoCaL films, which include case studies and information on how to set up community-owned renewable energy projects. There will be a local keynote speaker at each event to provide a local context. All community groups represented will receive a comprehensive PlanLoCal pack. Sessions will focus on how communities can get involved in local plan making, different kinds of renewable energy technologies, climate change adaptation, community engagement, and funding issues. All community groups represented will receive a comprehensive handout pack, including DVDs. Funded by Groundwork East Midlands, these workshops are run by the Centre for Sustainable Energy in association with Marches Energy Agency.